Origin and Habitat: South-eastern Namibia to Bushmanland and north-eastern Namaqualand South Africa. Type locality near Lislap, Boshmannskarroo. 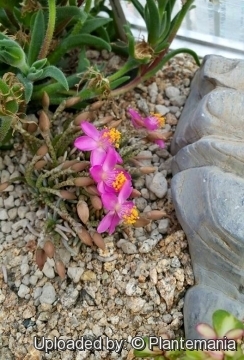 Habitat: Nama Karoo, Succulent Karoo. 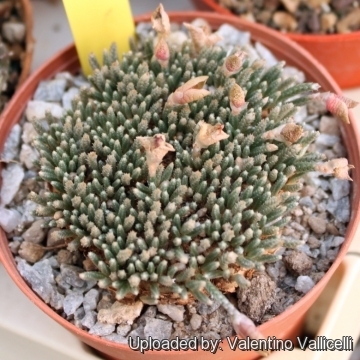 Avonia quinaria grows in dry flats and gentle and slopes on quartzite and red sand , under severe conditions - hard soil, dazzling exposure, little rain, in dwarf shrub and succulent steppe with other dwarf succulents like Adromischus nanus and conophytum ssp.. It is widespread and not in danger of extinction. 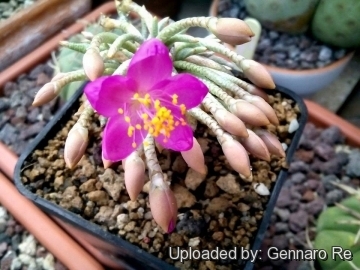 Description: Avonia quinaria is a dwarf perennial caudiciform succulent usually deep-seated, that flush with soil surface in habitat. Caudex: Turnip-shaped, fleshy to somewhat woody, flattened above, to 2,5-5 cm in diameter, (often pulled down into the ground in time of drought) with, a spherical crown of thin branches up to 2,5 cm above ground. 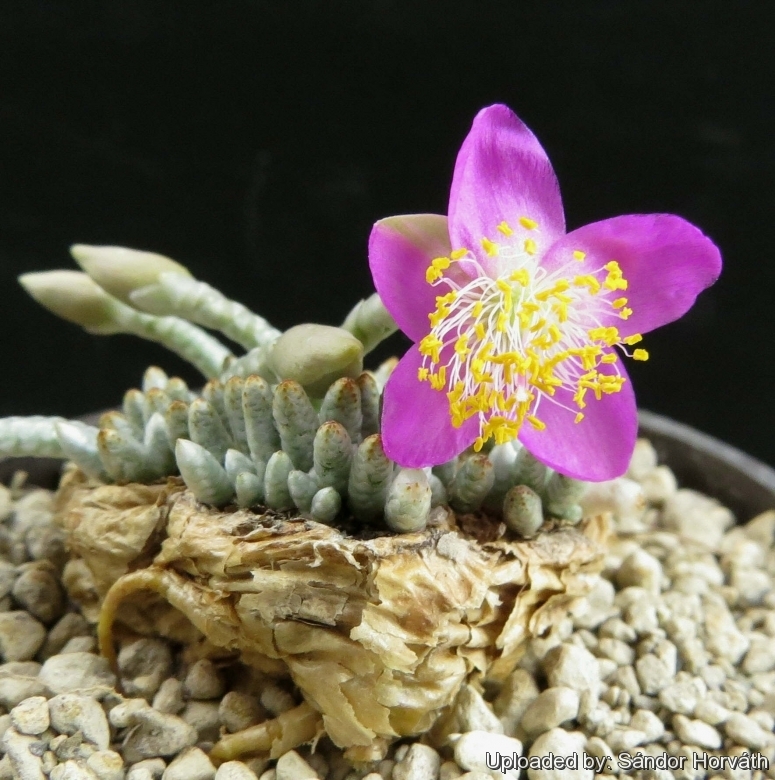 However some exceptional plants found in nature exceed 10 cm in diameter and could be several centuries years old. Branches: Sub-terminal, numerous, sterile and flower-bearing, undivided, very short, 2 mm thick. Stipules: Spirally arranged, and closely 5- overlapping imbricated, broad-ovate to triangular, entire, not hairy at the base, parchment-like, silvery with brownish spots. Leaves: Very minute semi-orbicular flattish, completely hidden by the stipules. stipules scarious, white, spirally involucral leaves larger, sphacelate at top; flowers exserted. Sterile stems: 2-4 mm long. Fertile stems: 8-12 mm long, terete, silver-coloured. Stipules: 1 mm, the involucre 2 mm long. Flowers: Carmine red or pink, 1,2-1,5 cm in diameter about 6 mm long. Sepals ovate, obtuse. 2–4 times longer than the involucre. 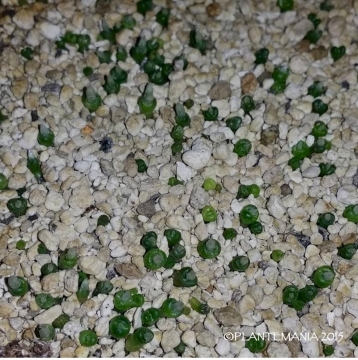 Self-fertile, they can produce seeds even if you have only one plant. 9) Raimondo, D., von Staden, L., Foden, W., Victor, J.E., Helme, N.A., Turner, R.C., Kamundi, D.A. and Manyama, P.A. "Red List of South African Plants". Strelitzia 25. South African National Biodiversity Institute, Pretoria. 2009. 10)Snijman, D.A. 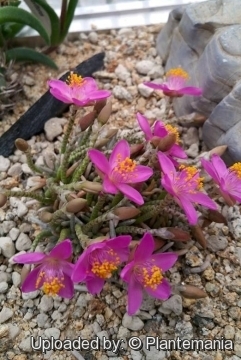 "Plants of the Greater Cape Floristic Region 2: The extra Cape flora." Strelitzia 30. South African National Biodiversity Institute, Pretoria.